I don’t imagine Playdom will shut down it’s Marvel Avengers Alliance Game on Facebook. Not anytime soon. But there are a lot of players concerned about how they should interpret the push for off-Facebook games. Obviously, there’s big… business, technology and community building advantages to building an off-Facebook game community. Zynga, the other big social game company, did it . How does this impact Playdom-Disney’s social game community and players on Facebook? 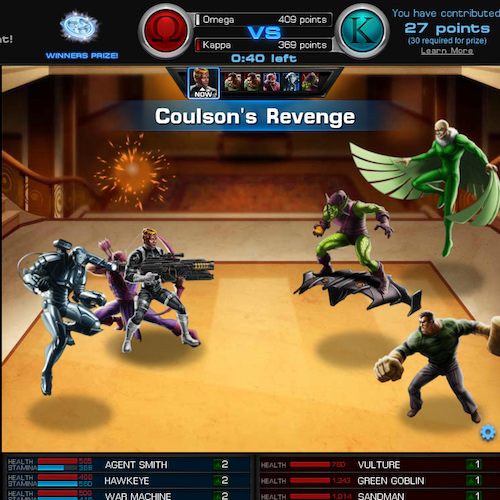 The Off Facebook Marvel Avengers Alliance Game (OFF MAA) is a better game for several reasons despite all the bugs and the yet unreleased new features. Below are five reasons to move over. 4. More gifts (up to 200 gifts per hour): Energy, Shawarmas, etc. 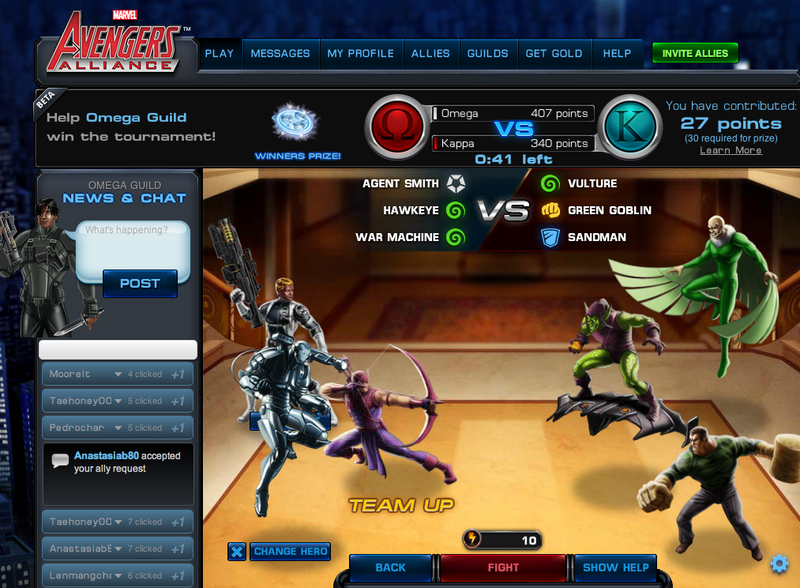 The chat and guild system alone make Marvel Avengers Alliance more fun. Your guild members will cheer you on (if you cheer them on) and your in-game accomplishments will contribute to the glory of the guild – possibly helping you and your guild mates win rewards such as Gold, Command Points, SHIELD points, and various other random supplies. Join the Omega Guild – it’s a great mix of experienced and new players. 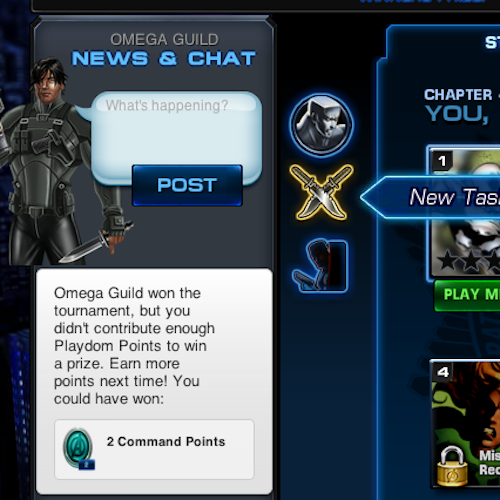 Omega Players are happy to answer questions and help new and old players get adjusted to this new, social experience of the Marvel Avengers Alliance game. The Guild Tournaments are hourly competitions between the Guilds for rewards including Gold, Command Points, SHIELD Points and more. Sometimes, Gold! Competition points are based upon player accomplishments, player gifts and other things. All of the members of that Guild with the highest points in a tournament wins various rewards. The Guild member that contributed the highest number of points in a given tournament gets 2 Gold. Myself, I won 2 Gold each from six tournaments. Yup, that’s 10 free gold. [grin] But there are others luckier and more determined than I. Most of the points will be made by clicking in the chat bar. Commend a player for an in-game achievement. Help a player that just made a new level. Congratulate a player! Send a player SHIELD Points. Welcome them to the Guild! Click it all for the team! Also, you can win 2 Gold if you clicked the most! But the guild has to win. It is also important to generate clickable chat content by agent level up, hero level up, mission completion, research completion, etcetera. Beyond the bug fixes, there’s a few things that’s needed to make this new platform a success for Playdom-Disney and the player community. 1. One way transfer of Gold, Silver, Command Points, Inventories (Weapons, Gear and Supplies), Heroes (without level) and Uniforms from the FB game to the OFF MAA game in the next 30 days. A 100 Free Gold Gift as an incentive would be awesome. 2. After that 30 day offer, Gold and Silver should be the only items that can be transferred over to the new account. 9. Private messages between players. Inbox accessible from Profile and Game Play. 1. How do I change the gender or look of my Playdom avatar? Go to the top right of MAA game window, mouse over the down-arrow next to your avatar, select settings, change gender and select a look. 2. Do I have to sent a paid gift? No, you can send a free or paid gift. It’s up to you. Warning: Gold paid gifts cost Gold. 3. How do I join the Omega guild? Go to Guilds. Next go to All Guilds. Find Omega and check it out. Then Join. This entry was posted on Wednesday, July 18th, 2012 at 2:20 pm and is filed under Games. You can follow any responses to this entry through the RSS 2.0 feed. You can leave a response, or trackback from your own site. Stan question for you my brother…Where prezactly does coulsons revenge come in at as i still do not have it and after registering is there somewhere im just not seeing to redeem the silver?Went to buy silver,then redeem code/coupon and it doesnt take,any ideas?Thanks..
There’s no notification. You just have to keep checking your OFF MAA account inventory from time to time (equip a new weapon for example). It took 72 hours for mine to show up. Some people get it in 5 minutes. The silver will just be added to your silver count. When it is added. i play from the facebook, how i do to get the free colson revenge? You don’t get a Coulson Revenge for FB. But you do get the cannon. See the link above. It seems to me that from the beginning Playdom has not really had a clue what they were doing. Almost like they bit off far more than they could ever imagine chewing. It is far too common to lose items, lose gold, lose whatever else, encounter bugs, etc. Do we need to talk about how long it took to figure out a fix to “looping”? What about the fact that the entire game is hacked? Really? And there has been next to zero Support for the game. The entire time the game has been out, Playdom has been so out of touch with the players that it took an Act of Congress to get them to change anything. The players said, “Fix Looping” — Playdom released more items you had to spend money to buy. The players said, “Fix Hacking” — Playdom released more stuff that had to be purchased for gold. The items don’t even make sense…. Take “The Witch Hunter”… What good is a gun that you shoot at “The Witch” when The Witch dodges it 99% of the time? When you do hit someone with the gun, it doesn’t take away any buffs that actually matter. It’s just stupid move after stupid move, almost like they don’t actually think about what they are doing before they do it. Their communication to the players has been almost zero. Their forums are the most flame filled forums I’ve personally ever seen, not to mention that now they are littered with “stickies” and so screwed up you can’t find anything. If you need more evidence that Playdom is totally out of touch, just go to their Official Facebook Page and look at all the posts about hacking and free gold and other junk — Playdom doesn’t even bother to remove the stuff. Today their entire Facebook Account was hacked and started posting links to sites that stick Maleware on your computer. The only drop of hope is that they have gotten a few new people on the “team” — I know some people have moved from Gazillion to help them, so hopefully they will be able to figure out how to actually run an online game. On the other hand, it makes me wonder — if they can’t handle the Facebook side of the game, what’s the “New Version” going to be? Same game, old bugs along with new bugs? The joy. Marvel should be ashamed they ever contracted Playdom to do anything. im level 91 in the facebook version, if the game goes off facebook and i have to restart at level 1, there would not be enough incentive for me to redo it all over again. too much time and effort to just start over.